A plane flying over the Kremlin and under the moon at sunset time in Moscow. I stopped by Red Square today to see the new Four Seasons hotel that finally opened after so many years. 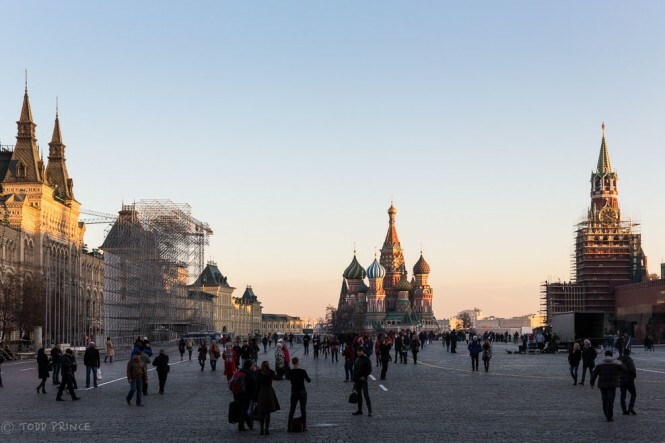 The weather was unusually warm and the sky was blue, so I first took a walk in the gardens in front of the Kremlin, where workers were fixing the pavement, and then to Red Square for a look at Saint Basil’s Cathedral as the sun set. 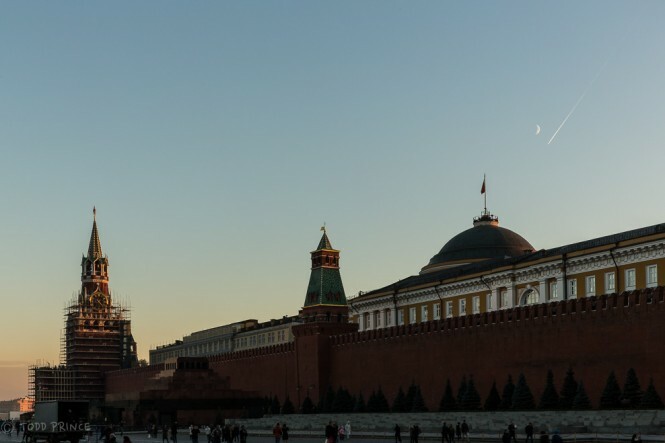 As the Kremlin walls are quite high, it blocks the sunlight late in the day. 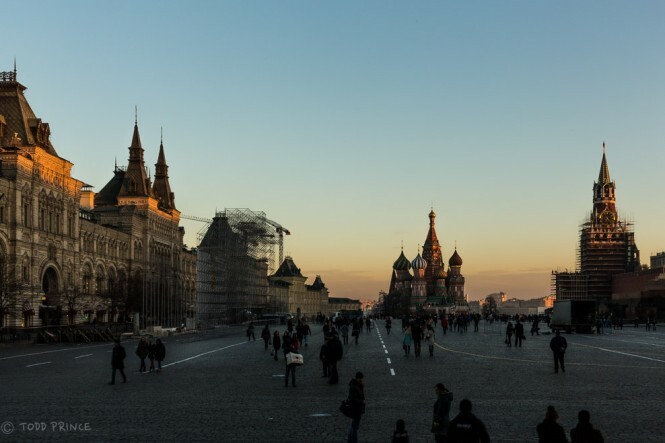 That leaves Red Square and the base of St. Basil’s Cathedral in shade while the cathedral’s colourful onion domes are still in light. 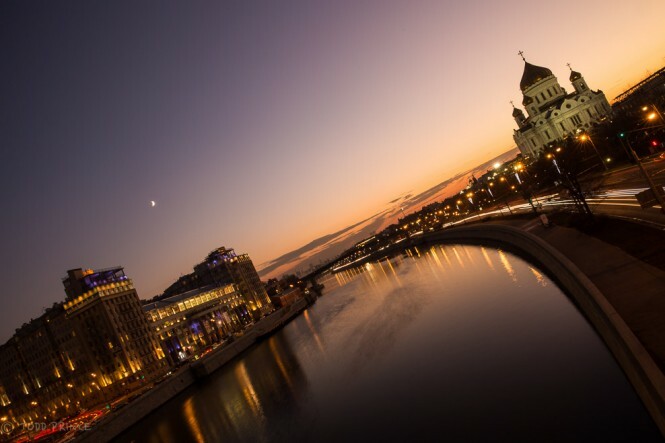 After the sun set, I walked back through the garden and onto the bridge that crosses the Moscow River between the Kremlin and Christ the Saviour Church. A pinkish color covered the sky above the Kremlin while an orange-blue covered Christ the Saviour. I have posted a few shots from today’s walk. The last bits of sunlight falling on St. Basil’s and GUM shopping mall. Russia will celebrate a national holiday on Nov. 4 and it looks like a stage is being built on Red Squre for the occasion. A pink sky covered the Kremlin after sunset. Chris the Saviour Church and a theatre (right) are split by the Moscow River. An orange and purple sky cover Christ the Saviour Church at dusk as cars race by. 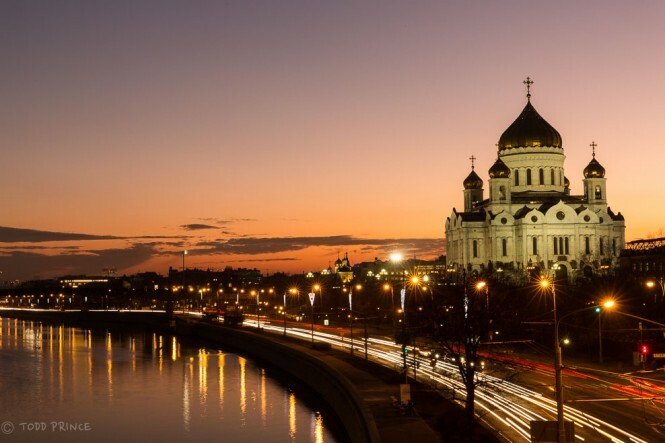 A man walks by the Kremlin Walls as the sun goes down beside Christ the Saviour Church. 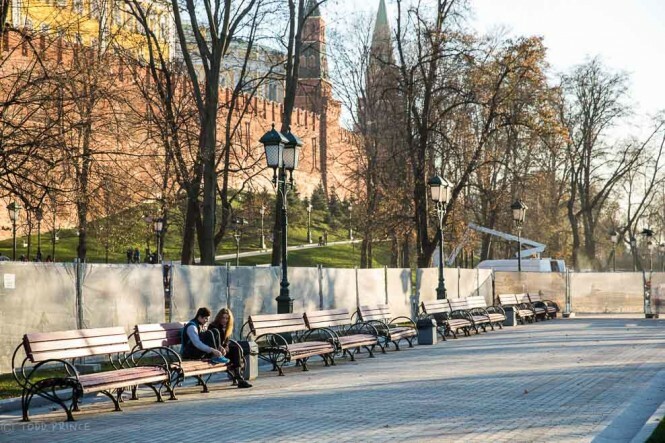 A couple sits alone in the garden outside the Kremlin Walls shortly before sunset. 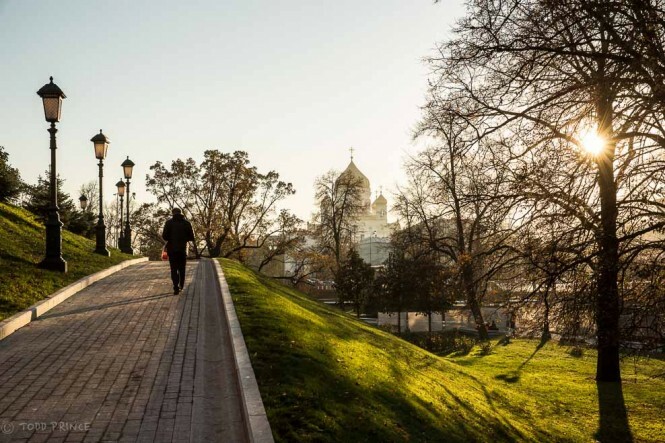 City workers repair the pedestrian paths cutting through the gardens in front of the Kremlin Walls. 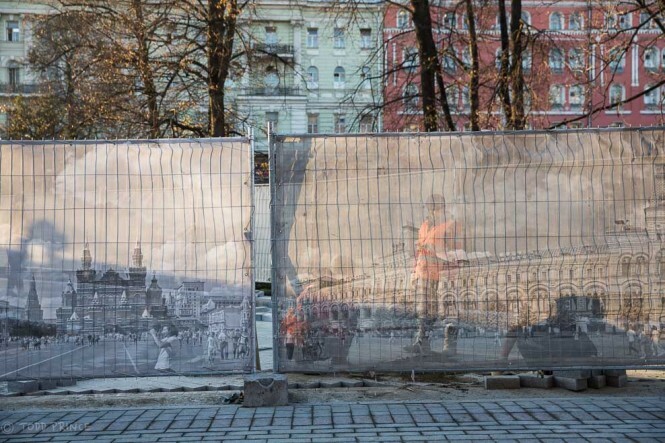 A fence covered with photos of Red Square partially hides the workers. 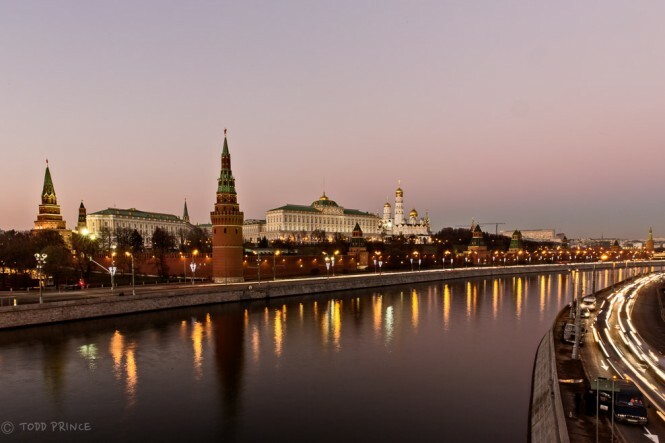 ← Moscow Skyscraper Hostel – Sign of Recession?